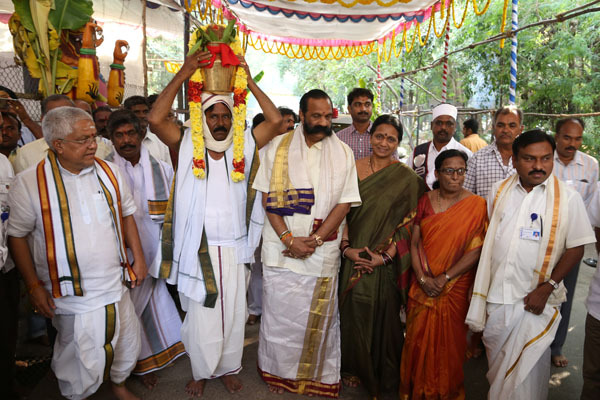 Tirupati, Nov 29: TTD Chairman Sri K.Bapi Raju and TTD EO Sri MG Gopal attended the Ganga Puja observed by TTD Water Works department in Kapilatheertham Temple on Friday evening. Speaking on this occasion Sri Bapi Raju said the Kapila Theertham falls are considered to be one of the holiest falls in Seshachalam ranges. He said this puja is performed every year to appease Goddess Ganga to quench the thirsty of denizens. TTD JEO Sri Pola Bhaskar, SE Sri Sudhakar Rao, EE Sri Jagadeeswara Reddy , Dy EO Sri Chandrasekhar Pillai and water works dept staff took part.